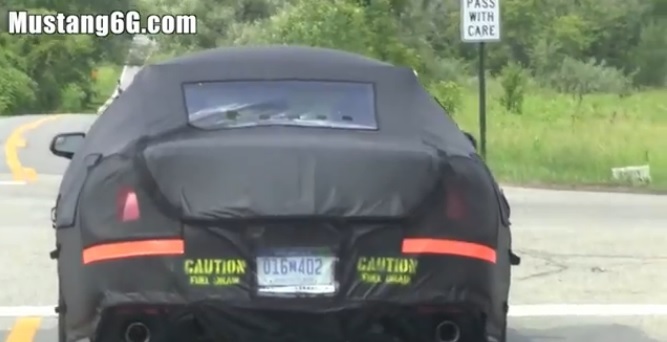 What you’re looking at here is another 2015 Mustang prototype cruising around Detroit. Spotting the new Mustang in the wild hasn’t been a difficult task lately, but what sets this new video footage apart is the glorious rumble of its V8. Wary Mustang enthusiasts rejoice, the 2015 Mustang indeed will have a heart-warming V8 under its hood come 2015. Ford has been actively testing the new Mustang, probably fine-tuning the design for release at the 2014 NY Auto Show and fortunately for us, there’s been plenty of spy photographers capturing the action. Here we see a couple guys out testing an S550 mule that have a hunger for the go pedal, aggressively revving the V8 from a quite rumble up to the soothing growl we’ve come to expect from a Ford Mustang. I must say, that’s a mighty fine sounding V8–definitely something worthy of the Mustang’s platform. Next Entry Get Ready – The 2013 AmericanMuscle Car Show is Almost Here! I need to go to… the uhh… shower to uhh… think about what I just heard! Yeah a SUPERCHARGED 4.7 can hit the same HP as a stock 5.0. Put a supercharger on a 5.0 and see what you get. i have a 2011 GT that is pumping out 420 horses stock. Pretty dang sure that 4.7 didn’t do that stock. By the way, there is such a thing as grammar and punctuation. He may have dropped a 4.7 in to his car. I had the 4.6L GT and loved it but I have moved up to the 5.0L. The sound, power and even the gas mileage is better. Great leaps for the Mustang for sure… I just wish they would do something better with the non-functional (unless you are a little person) rear seat ha ha. Why is it that you always see pics of the side and front of the car, but never the rear of it?!?!?!?!?! ?